Reports have been good again this week. 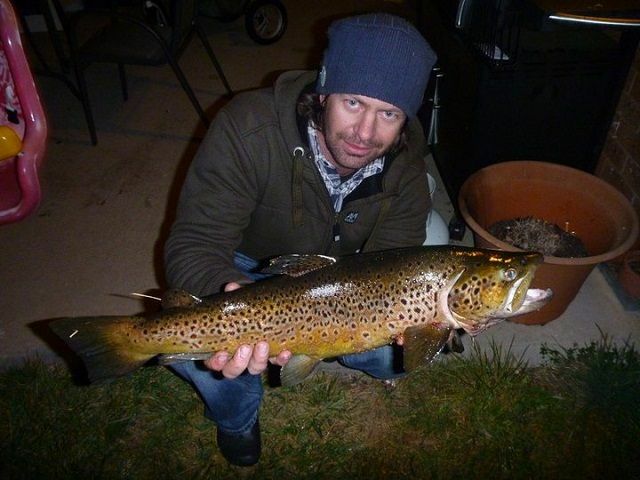 Check out the angler reports and photos we have received. 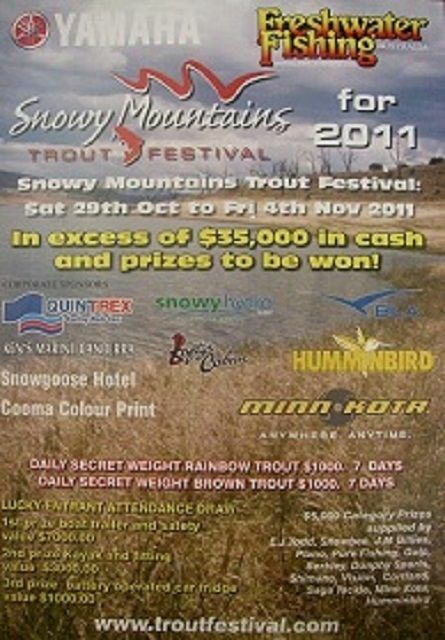 In the last week there has been plenty of snow in the mtns so there are plenty of fish going up both Eucumbene and Thredbo river so be ready for some good fishing. Hey guys, just a few pics of the fish caught by my dad and me out on the local rivers recently we fished for ten days and caught a heap of fish on lures and spin drifting nymphs and glo bugs on average we were getting ten fish a day a mixture of rainbows and browns all were released after a quick couple of photos the biggest of the lot was an nice coloured 63cm 7 pound brown then a pair of 6 pound browns a couple of 5 pounders and plenty of 4s and 3s most of the rainbows were around the 2 pound mark the best was 48 cm and 3.5 pounds. There has been some great trolling up on Jindy over the last few weeks, with the best area's being out around the islands in the main basin in front of town & Sid's Bay at East Jindy, up around Waste Point and at the top of the lake around Kalkite. Fishing a mixture of small minnows like RMG Scorpions, Merlins & Attacks along with Tassies in just about all the "Yellow Wings patterns and Squidgys are working well around the snowy arm. 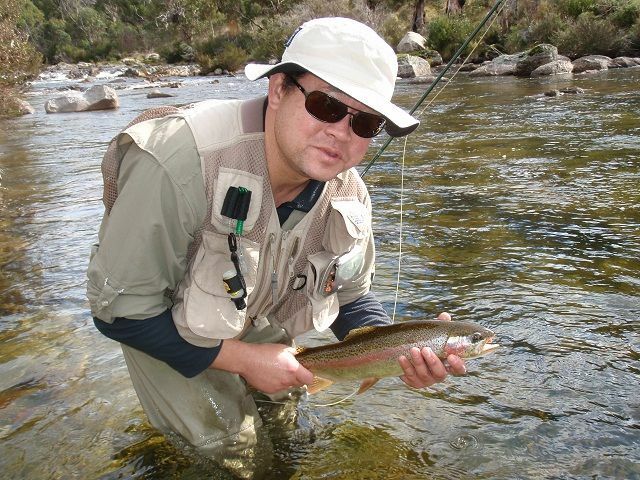 Benny landed this cracker brown while twitching a purple woolly bugger in Jindabyne. 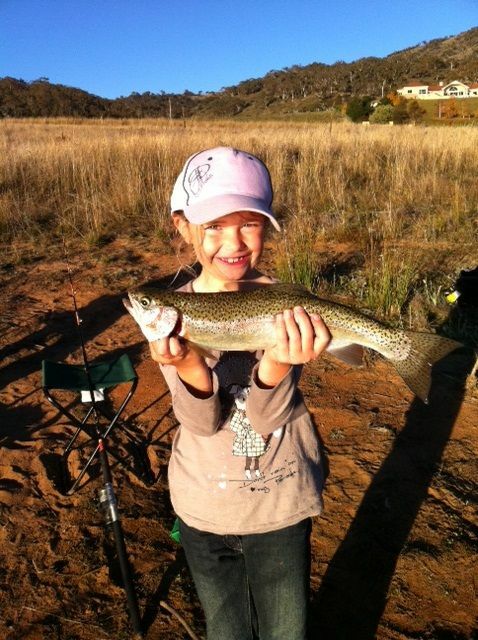 Reports have been patchy but there are still some good fish being caught. 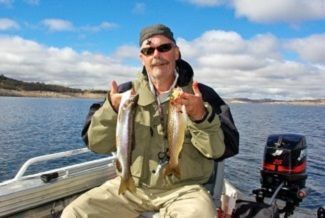 Leadcore and Downrigging has been the best bet although some anglers are picking up fish on flat lines as well. 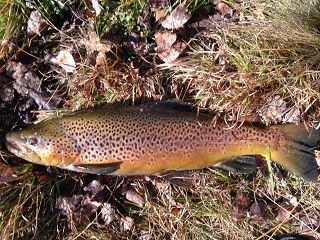 Early and late has been the best times, as usual but some are still being caught during the day. 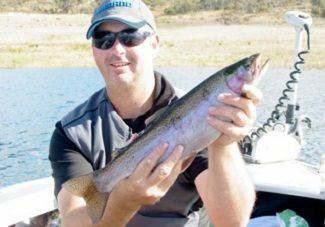 Once again the river mouth is an area that too few anglers concentrate on with soft plastics and Rapala minnows in brown and rainbow. This is a definite hot spot to try these methods at present. Mick Walker and Warren Ross stopped by to say hello on Friday on their way to Buckenderra, and to get a couple of things. Trolled in the afternoon for 2 fish about a kilo each. Best day was Saturday after the fog lifted, could not see a thing and with no GPS went round in circles until the boys from 'Design services'(Name of boat) stopped by and led us into the sunlight. WE started to troll but saw a few fish moving and decided to chuck a few hard bodies at them. Mick tried a hard body he bought from a market on the Gold Coast (Black body, gold fleck and hot pink underbody) and did the fish hit it hard. 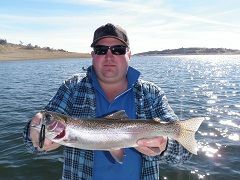 Warren tried a few different lures trying to match Mick's Killer but only took 4 fish for the day. 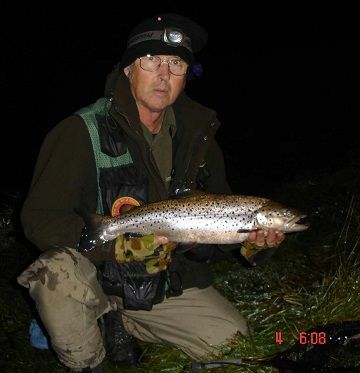 Mick hooked onto about a dozen and had quite a few follows, one being a brown of around 5-7lb. 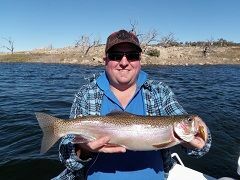 His best fish landed was a well conditioned Rainbow of around 3lb.Most were in really good condition and full of yabbies. Best areas were along the weed banks. 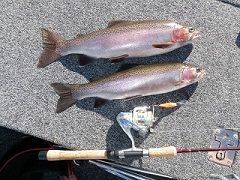 At one stage we had a double hook up so a great day was had. 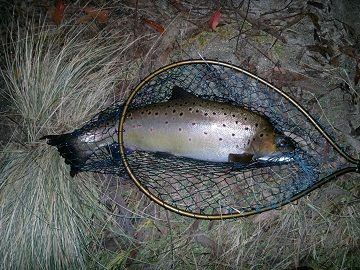 Jay Allen sent in these pics of his mate Medz at Buckenderra.